LOS ANGELES (AP) — A Pacific storm that brought fears of dangerous mudslides and a rare blizzard warning in the Sierra Nevada was less fierce than expected but hundreds of homes in fire-scarred California areas remained under evacuation orders as more rain was expected. By nightfall, there were few signs of damage, but evacuations remained in effect for more than a half dozen areas of Ventura and Los Angeles counties affected by last year’s Woolsey Fire. The blaze that broke out in November destroyed more than 1,500 homes and other buildings from Ventura County to Malibu and killed four people. All schools in Malibu were closed Tuesday. In the gated community of Bell Canyon in Ventura County, Paul Manion was busy filling sandbags in case denuded hillsides sent debris sweeping down. Several thousand people heeded a mandatory evacuation order in Santa Barbara County on the Central Coast, where last year a sudden debris flow swept through Montecito, killing 23 people and destroying 100 homes. Daphne Moore was among the evacuees. “It’s a complete drag but it’s better than dying in a mud debris flow,” she told KNBC-TV. However, the rain that fell Tuesday wasn’t heavy enough to cause disaster and the county lifted the orders as of 6 p.m.
More rain was expected Wednesday but not enough to be a serious threat, officials said. An evacuation warning was scheduled to take effect Tuesday night and continue into Thursday morning in Butte County, site of the deadliest and most destructive wildfire in US history. The Camp Fire destroyed nearly 15,000 structures and killed 86 people in November. The evacuation warning is for the community of Pulga, a canyon community near the town of Paradise, which was virtually incinerated by the blaze. Meanwhile, a blizzard warning for much of the Sierra Nevada and Lake Tahoe was set to go into effect Wednesday night, with meteorologists predicting as much of 5 feet (1.5 meters) of snow in upper elevations. Dangerous and potentially life-threatening blizzard conditions were expected at elevations above 7,000 feet (2,133 meters), with high avalanche danger throughout the region. Weather forecasters have predicted a series of storms that could keep bringing rain and snow through the middle of the week. The first in the series of storms dumped an inch of rain in Los Angeles and snow in the mountains Monday. Rain closed the Knott’s Berry Farm and Six Flags Magic Mountain amusement parks. In San Diego County, a 20-foot-long (6-meter-long), 20-foot-deep sinkhole developed on an Interstate 805 off-ramp near Serra Mesa. A mudslide closed a 4.4-mile (7-kilometer) section of Pacific Coast Highway just north of Malibu on Monday for several hours. In Encino, in the San Fernando Valley of Los Angeles, a 250-foot-long (76-meter) debris flow from a hillside pushed a guest house off its foundation. No one was hurt. Ice and blowing snow also shut down a major route connecting Los Angeles with San Francisco. 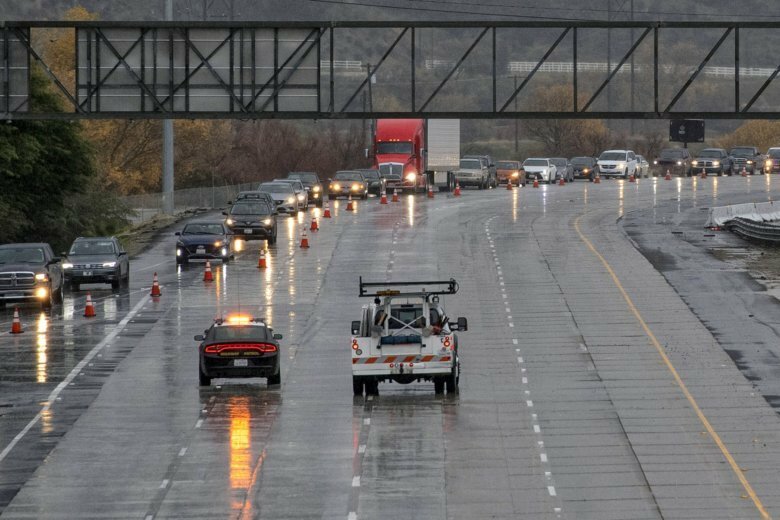 Dozens of cars and trucks were stranded for hours before the Grapevine, a high pass on Interstate 5, reopened after nightfall.